In a study published in Oral Diseases, researchers discovered the people who were obese were six times more likely to have infected gums. The connection between obesity and gum disease is not yet clear, but it may have something to do with inflammation. Obese people tend to have higher levels of inflammation than their slimmer peers, and people with higher levels of inflammation are more likely to experience gum disease. What’s more, people with gum disease are also at significantly higher risk of developing heart disease and diabetes. More than one in five people with diabetes also suffer from gum disease, and gum disease makes it more difficult for people with diabetes to control their blood sugar. It’s not just heart disease, obesity, and diabetes that can occur as a result of neglecting your oral health. Recent research has found that those with poor oral health may also increase their risk of memory loss, miscarriage, and stroke. Of all the things you can do to reduce your risk of serious illness, taking care of your mouth may be one of the simplest. Soon after brushing, plaque begins to coat the teeth. This plaque is soft and easy to remove, but over the next several hours, plaque absorbs minerals from the saliva and begins to harden. Along with absorbing minerals, plaque also provides a nice home where bacteria in the mouth love to live and colonize. These bacteria produce acids that wear away tooth enamel and weaken your teeth, and that plaque and bacteria under the gums can cause swelling and bleeding. What you may not know is that, as tartar and bacteria build up under the gums, disease progresses, causing pain, bleeding, loose teeth, bad breath, and changes in bite, along with increased swelling and bleeding, especially during brushing. Pain from gum disease can make eating nutritious foods difficult, but the damage goes deeper than difficulty eating. Like any other infection in any other part of your body, your immune system responds by producing chemicals and cells to fight the germs. The flood of bacteria, inflammation, and immune cells can damage tissue and increase the risk of many health issues or aggravate existing conditions. Recent research has found that bacteria under the gums can enter the bloodstream and affect blood clotting mechanisms and insulin resistance, as well as increasing fatty deposits in the blood vessels. It can even interfere with brain cell activity and form colonies in other areas of the body. Gum disease has been linked to increased risk of heart disease, heart attack, stroke, diabetes, memory loss, dementia, miscarriage, pregnancy complications, pneumonia, lung disease, osteoporosis, and even certain types of cancer. 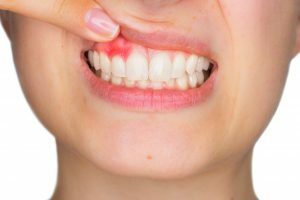 It’s important to realize that the connection between gum disease and these conditions is still being studied and that it has not yet been proven that gum disease actually causes these things. It’s entirely possible that there are other factors in common. Brushing, flossing, and regular visits to the dentist can save you a lot of pain, and could even prolong your life. If you’re due for a dental visit, please call your pain free dentist at Westside Dentistry to arrange an appointment on 07 3278 0580 now.